I co-developed a puzzle game for iOS and it was released on 27 October on the App Store ($0.99). 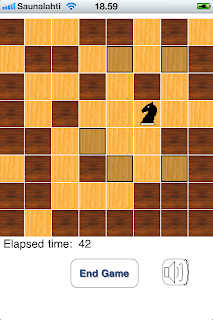 In the game you ride your knight on the chessboard, filling empty squares as fast as you can or creating a path. Today I implemented an algorithm that produces correct shadow volumes for non-closed meshes, aka meshes with open edges. I couldn't find it anywhere on the Internet so I decided to publish it here. It's from Game Programming Gems 4. The gist of the algorithm is to add inverted face normals and point edges with missing neighboring face to them. To use it, call generateOpenEdgeTriangles() after generateEdges(). // Indices of two vertices that belong to the same triangle. Used to construct shadow volume sides. // Finds the other face that's touching vertices v1 and v2. // Finds out the # of open edges. I uploaded release 3. It mostly contains bug fixes (Debug build now works in Visual Studio etc. ), but new features include support of PVR compressed textures and automatic loading of compressed textures if present. Download the release here. In other news, Death Rally for iOS is selling well and the first update is coming soon. My role in the development has mostly been graphics performance profiling and optimizing and other graphics related stuff. 1. Adding Default@2x.png to an SVN repository using command line client. Command line svn client doesn't like the "@"-character. Oddly enough, escaping it with "\" doesn't work, but what works is this: "svn add Default@2x.png@"
2. Resizing your website to fit the iPhone screen.